Full Speed for the Diggings! The discovery of gold in California in 1848 is arguably the most important event in the development of the United States. It brought commerce, the telegraph and later the railways to the West. American influence spanned the continent for the first time, laying the foundations for its position as a world power. It also brought lawlessness and the myth of great riches to be found in the goldfields. During the 1850’s thousands of Americans travelled west; some to make their fortunes in the goldfields, others to deprive the miners of their gold in makeshift saloons with bad whiskey and rigged gaming tables. Legends were created and the west became synonymous with wild living, outrageous conduct and adventure. But for one group of pioneers it brought the opportunity to make money while providing a much needed service: the Expressmen. The United States Post Office Department was slow to bring postal services to the mining camps, and the miners were reluctant to leave their claims for supplies and travel two or three days to the nearest town for fear of claim jumpers. So the expressmen did more than carry letters; they brought supplies, mining equipment, newspapers, and carried back the miners’ gold dust for banking, and letters to their friends and relatives back east. There are some 1,870 different known expresses that carried on business in the west during the nineteenth century. Of these about 370 had identifiable franks. Some expresses were in business for only a few days while others provided a regular service for many years. Very often the routes to the mining towns were rough tracks only suitable for pack mules. Granville Zackharian operated an express known as Zack’s Express from 1865 to 1866. The 150 mile route he followed was over rugged country from Downieville to Marysville. This included seventy miles of almost continuously ascending and very rough trail up to and along the Gibsonville Ridge where many mining camps had been established. He carried fifty or sixty pounds of mail on his back, walking with snowshoes in the winter, and riding on horseback when the route was not snowbound. 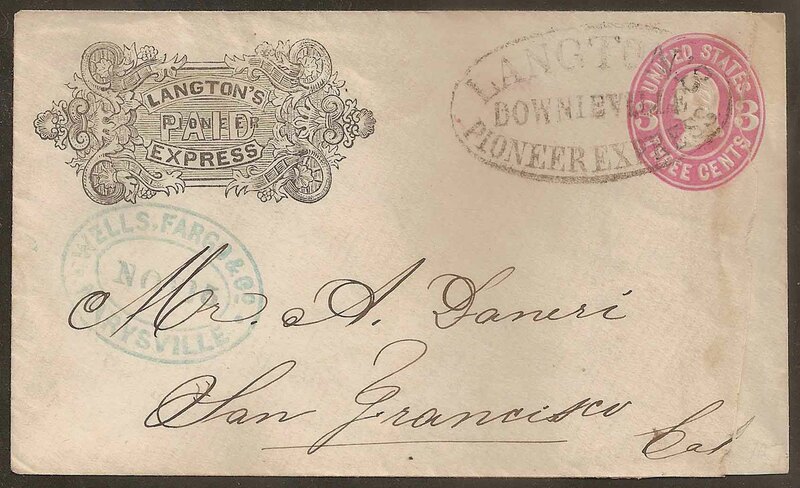 Lettter carried by Langton’s Pioneer Express circa 1864. Carried by the Express from Downieville to Marysville and thence by Wells, Fargo & Co to San Francisco. Another seasoned expressman was Samuel W Langton. He started his business in 1850 serving a route from Marysville up the Yuba River, taking in Grass Valley, Nevada City, Downieville and other camps. He gradually expanded the territory he covered, operating lines of stage-coaches as well as his express service. From 1859 he connected with Wells, Fargo & Co at Marysville. In 1864, at the age of 34, he was accidentally thrown from his buggy in Silver City, Nevada Territory, sustaining fatal injuries. His family tried to carry on the business, but could not emulate his energy and business acumen. 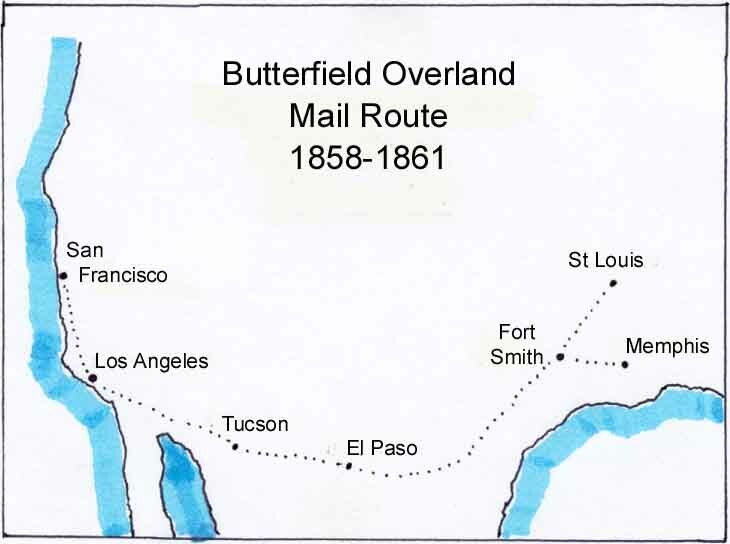 Map of the Butterfield Overland Mail route 1858-1861. No list of expressmen would be complete without mention of John Butterfield. In the late 1850’s the citizen’s of California had become so exasperated with the poor roads and mail services between the East and West of America that they petitioned the government for better services. The government contracted with John Butterfield for the establishment of a Southern Mail Route. He surveyed and constructed the road and the route began operating on 15 September 1858 with coaches carrying both passengers and mail. The eastern starting points were St Louis and Memphis, and the western terminal was San Francisco. There was a twice weekly service in both directions. It took 24 days to complete the 2,800 mile route. It was hardly a comfortable journey and passengers were often required to get out and walk up the steep inclines and help push the coach when it got stuck. 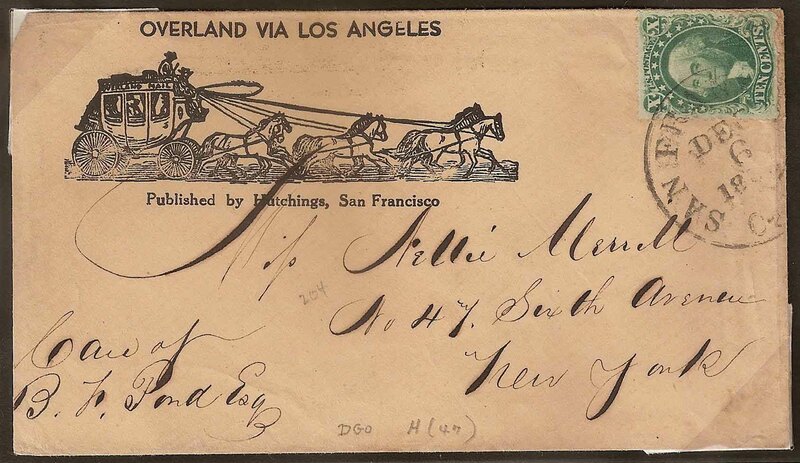 Letter carried by the Butterfield Overland Mail route in 1858. With the Start of the American Civil War and the fear that the route would be disrupted by the Confederacy, the Union Government transferred the contract to the Central route on 11 May 1860. The Overland Mail Co finally stopped running on 1 March 1861; drivers and horses had been conscripted to the Army! Several types of printed ‘stage coach’ covers were used to indicate mail to be carried over the route of the Overland Mail. 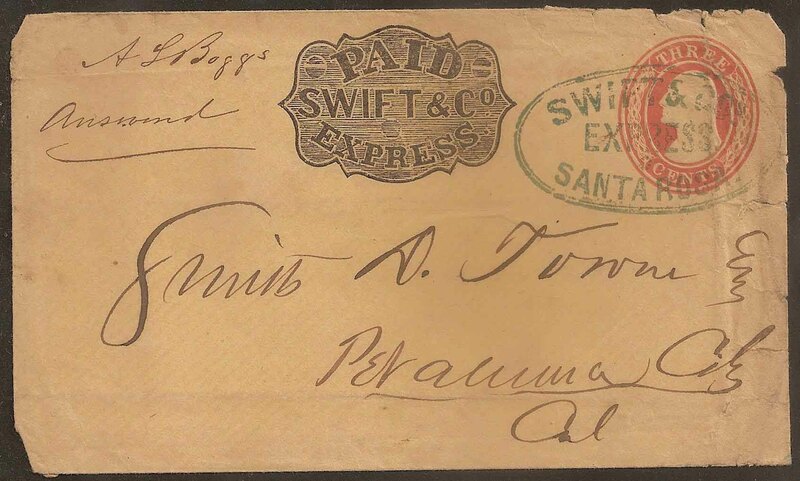 Letter carried by Swift & Co from Santa Rosa to Petaluma, circa 1857. Of the many other expressmen it is worth mentioning E Swift who operated Swift & Co’s Express from San Francisco to Bodega and Petaluma from 1854 to 1859, connecting with Wells, Fargo & Co at Petaluma. There was also John M Freeman who began his career as an expressman in 1850, selling out to Wells, Fargo & Co in 1859 after several ventures in the express business. 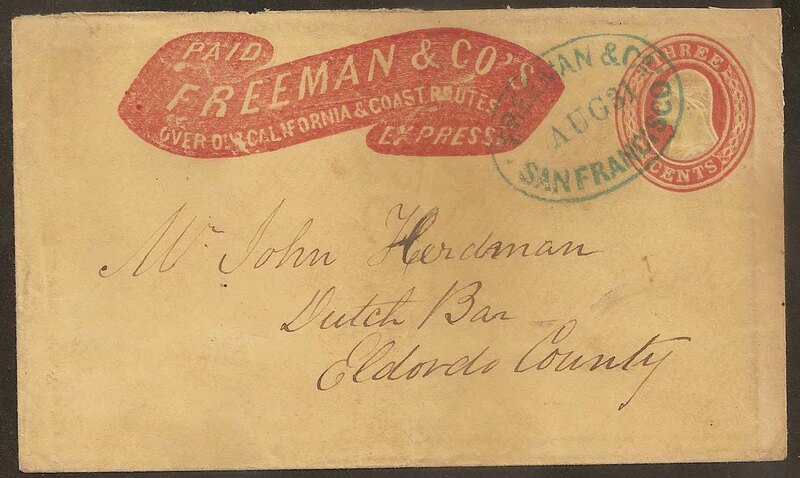 Letter carried by Freeman & Co’s Express from San Francisco to Dutch Bar, circa 1855. 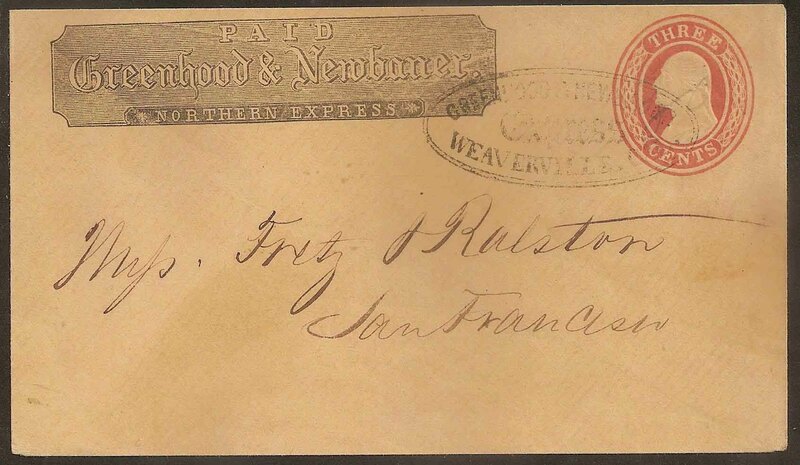 Letter carried by Greenhood & Newbauer Northern Express from Weaverville to San Francisco showing the error of spelling in the name. Some strange errors can be found on the franks used by expresses. Greenhood & Newbauer Northern Express had a frank similar to that used by Wells, Fargo & Co. A supply of their franks was printed with the ‘u’ in Newbauer inverted reading ‘Newbaner’. The Post Office had a monopoly over postal routes and had declared all roads as postal routes. It was therefore necessary to pay the government rate of postage in addition to express charges. This was normally done by impressing the express company’s frank on government printed stamped envelopes. A three cents stamped envelope bearing the express company’s frank was typically sold for ten cents. Thus the erroneously printed franks of Greenhood & Newbauer were worth three cents each to the company and rather than lose this value the envelopes were sold and used in the normal way. Every western film seems to have a Wells, Fargo & Co stage-coach or express office in it. Perhaps this portrayal of the company is not too far from the truth. Henry Wells and William Fargo created the largest express company in the west from small beginnings. They opened their first office in the west in 1852, and built their business on honesty and reliability so that their name soon became a byword for dependability. They bought out their rivals, or where this was not profitable or practical came to an agreement not to encroach on each other’s routes. Thus Wells, Fargo & Co became one of the major business concerns in the early west. 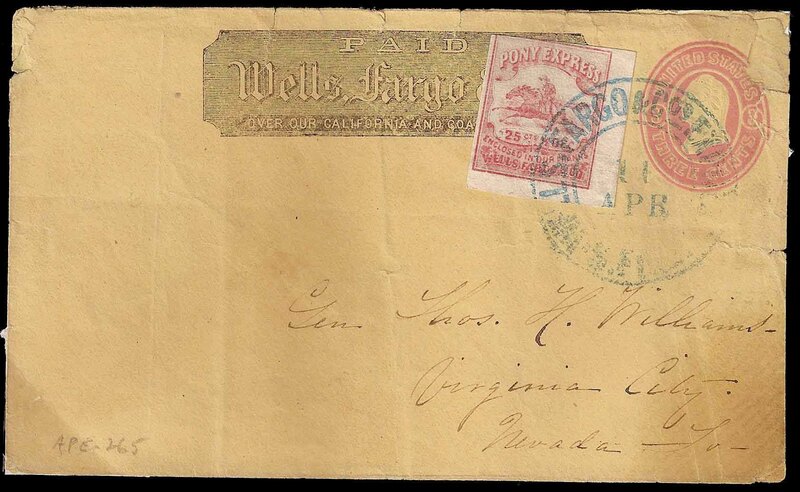 Letter carried by Wells, Fargo & Co over their Virginia City Pony Express route from San Francisco to Virginia City in 1865. The express charge was paid with the Company’s 25 cents red local Pony Express stamp. They had a part in the running of the legendary transcontinental Pony Express, and ran their own Pony Express between San Francisco and Virginia City. But with the arrival of the railroads many of their stage routes became redundant and they had to buy into the new transportation systems. Wells, Fargo & Co’s name still survives as a banking concern, bur their mail services finished in the 1890’s when improvements in the government service made it unprofitable to continue. Whilst some of the long-lived expresses have left a considerable quantity of material for collectors, there are many that operated for a short time with only a handful of covers known. The average collector might find it difficult to form a representative collection of original western covers, but there is an alternative. 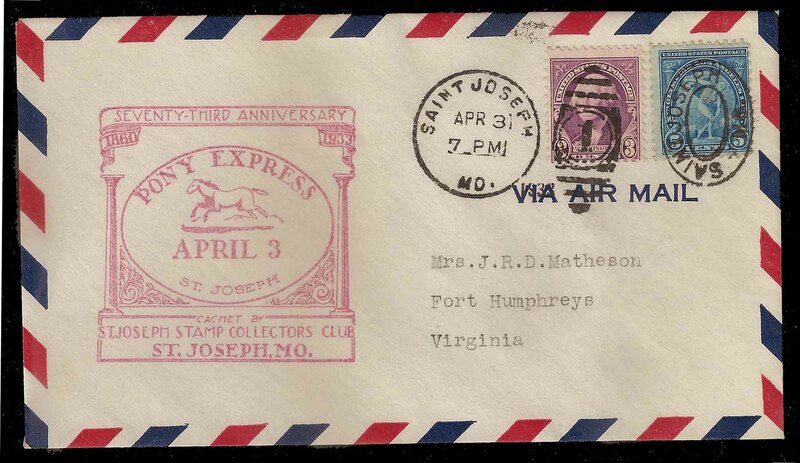 Modern cover commemorating the 73rd Anniversary of the Pony Express in 1933 with cachet of the St Joseph Stamp Collectors Club. There are numerous modern covers commemorating the west and these can be collected at an affordable cost. They give an insight into the ways the mail was carried in the old west. Several commemorative runs of the original Pony Express have been made in recent years and many United States stamps commemorating the old west have been issued and can be found on special event and commemorative covers.